The CAV511C.FT6016 TAG Heuer Grand Carrera Calibre 17 RS Chronograph Racing Steel Men’s Watch is part of the latest additions to the Grand Carrera line, and was recently debuted at the Basel Fair in Switzerland. Not yet available to the public, this watch will undoubtedly be a hot ticket item when it is released later this spring. 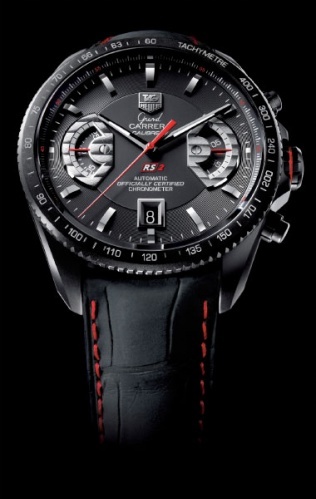 The TAG Heuer Grand Carrera Calibre 17 RS Chronograph Racing continues TAG Heuer’s excellent line of racing-inspired watches. It sports two rotating systems for the chronograph movements. At 3 o’clock seconds are measured, and at 9 o’clock minutes are measured. A date window can be found at 6 o’clock. The rotating systems are decorated with Cóte de Genéve black gold and diamond facets, while the date window is outlined in black gold. The indexes and hands are also finished in black gold. While these decorations are set against a black opal dial, making them subtle, their subtlety maintains a high degree of elegance. Other features on the 17 RS Chronograph Racing includes a sandblasted black grade 2 titanium tachymeter scale bezel set on a finely brushed stainless steel case. It has a double sided antireflective sapphire crystal and double sapphire case back. Its screw-in push buttons and crown are made from grade 2 titanium. It comes with either a black rubber strap or a solid stainless steel bracelet. The watch is water resistant to 100 meters.